1 Can I use Kakao Metro offline? Open the content area. Subway map, station information, timetables and route search are available offline. 2 Convenient and helpful tips available only at Kakao Metro!! 01.Carriage near the exit Open the content area. 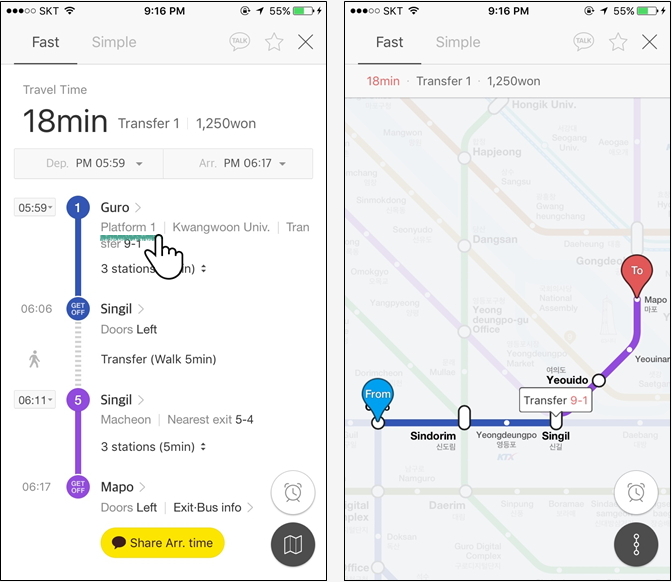 Kakao Metro offers more than which carriage to take for quickest transfer. It will tell you which carriage to board to arrive adjacent to the subway exit you need! 3 Convenient and helpful tips available only at Kakao Metro!! 02.Bus information by exit Open the content area. Check out bus stops, bus numbers and arrival updates for each exit. 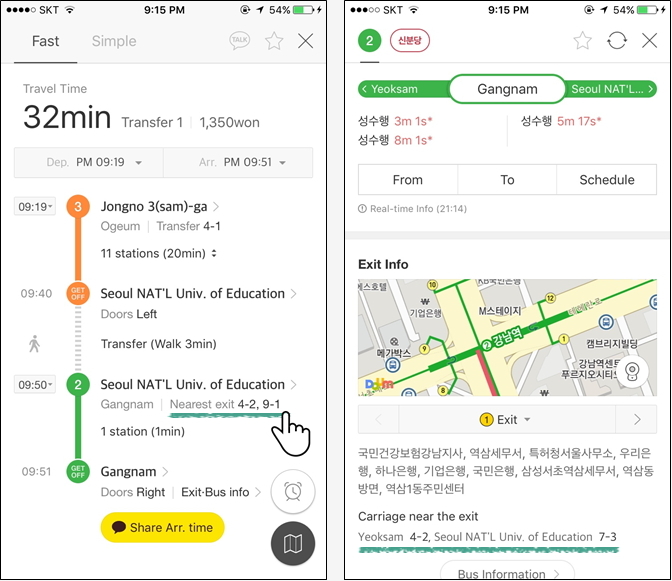 Without opening another app, you can access arrival information for buses you can transfer to from the subway. 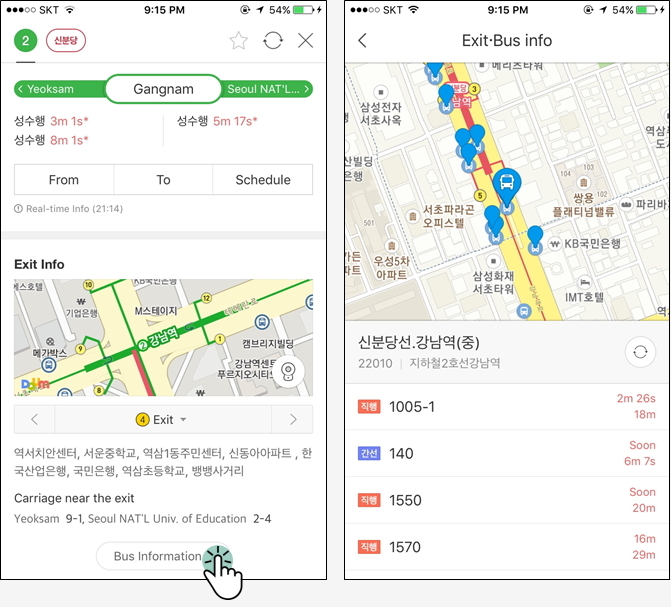 Detailed information are available via Kakao Bus. 4 Convenient and helpful tips available only at Kakao Metro!! 03.Platform Information Open the content area. Finding the right platform can be challenging and confusing especially at stations with multiple platforms. 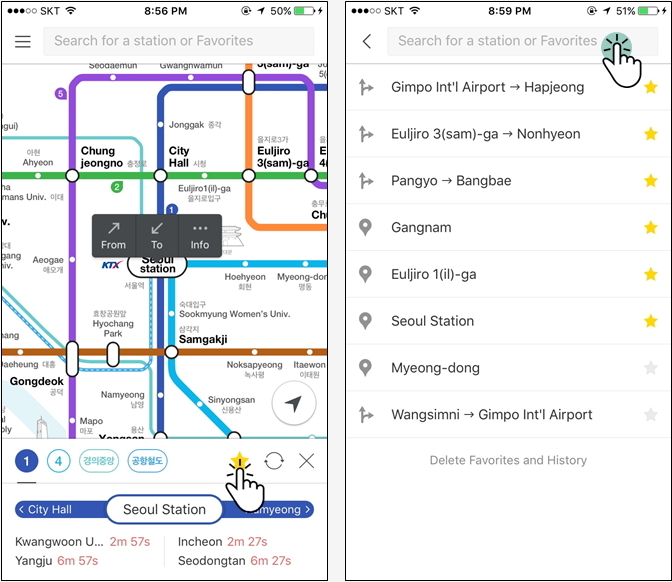 With Kakao Metro, you will find your platform easily without getting lost. 5 Convenient and helpful tips available only at Kakao Metro!! 04.Express Trains Open the content area. Need information on exp. train stops or timetables? You can choose to look at only the information on stations where exp. trains run. 6 Do I have to log in to use Kakao Metro? Open the content area. You don't need to log in to access main features like Station Information, Favorites and Route Search. However, when you log in with your Kakao Account, you can back up or restore Favorites, which will be a convenient feature when you change your phone or use multiple devices. 7 How is the transfer time measured? Open the content area. To provide more accurate information, our Fieldwork Team measured the actual distance between stations, and calculated the time required for transfer based on the average walking speed for adults (4.5km/h). 8 How many items can I add to Favorites/History? Open the content area. You can add up to 20 items to Favorites/History per city. If the maximum number is exceeded in History, the item added first will be deleted first. -How to add to Favorites: Press the Favorites (star) button on the top right corner of the "Station Information" and "Search Result" pages. The white star will turn yellow and the item will be added to Favorites. -How to remove from Favorites: Press the Favorites (star) button again on the "Station Information" or "Search Result" pages, or from the Favorites list. The yellow star will turn white and the item will be removed from Favorites. 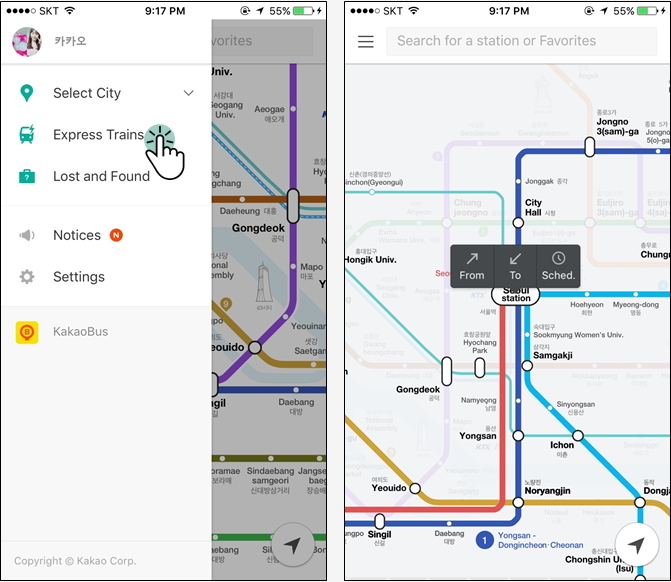 -How to check your Favorites list: Tap the search window at the top of the subway map and you can see your Favorites list. 9 Is the arrival schedule shown in Station Information realtime information? Open the content area. The default arrival schedule is based on realtime info. You can change the service setting to get timetable info. 10 Is the express train information also provided during route search? Open the content area. 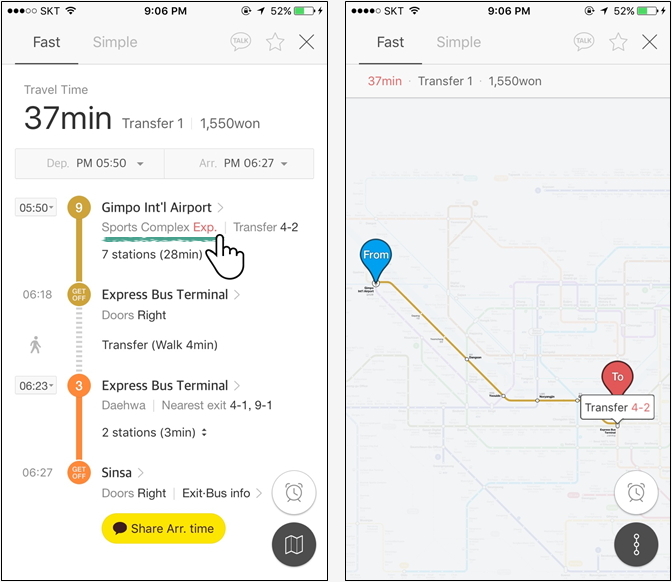 For routes where express trains run, Kakao Metro considers both the express schedule and the general schedule to provide the most efficient search result.